"I couldn't find this gem on your site so I thought I'd tell you about it. 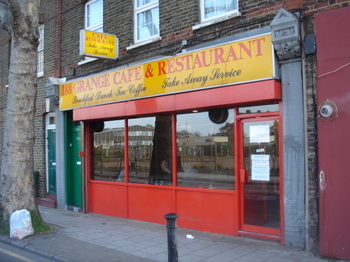 The Grange Cafe, 188 Grange Road, Bermondsey. This is a completely unspoiled builders' caff that happens to be on my street. 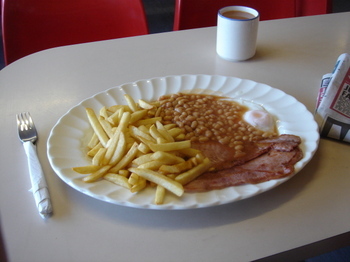 Authentic screwed-in plastic bucket chairs, formica tables, sergeant majors' tea served from a pot, and everyone's favourite revivifying breakfast food (eggs, bacon, chips and beans) for £4.10 (two eggs, two slices, all on a massive oval plate). There's also a fruit machine in there that, it is rumoured, only the owner, a taciturn and gruff man called George, ever plays. Service is quick, and there's a selection of red tops to read as you scoff, although reading the Guardian is tolerated." The plates are huge. It's hard to convey how huge, but look at it next to that knife and fork. Lots of lovely, lovely bacon, pink and soft and meaty. The chips and more your fry types; thin, golden, pale, soft and crunchy. The egg swims in the bean juice, poking up like a volcano. All high quality and tasty. 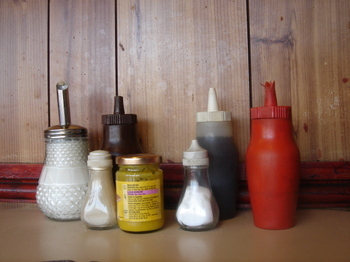 Beautiful looking condiments. There's something in the light that gives them an oil-painting quality. The simple forms help with the still-life-ness, the mustard label adding a visual focus. Or something. Surely these tables and chairs are design classics by now. Is there some committee we can talk to about getting them registered with a design museum or interiors magazine? Nice big bright yellow menuboards. And, though you can't see them in these pictures, there's some good historical pictures and letters from people who ran the cafe in previous years. 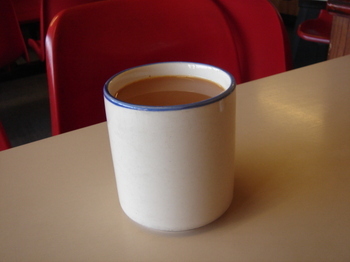 And a very respectable cup of tea too. 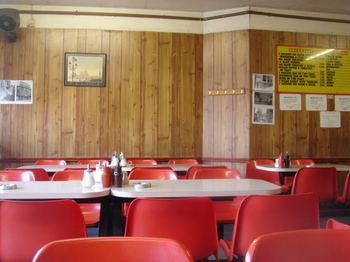 Are there any caffs close to the Brunswick Shopping Centre you think are worth going to for a fry up? The one within the centre is closed due to building work. There's Valtaro Snack at the northern end of Marchmont St, it's pretty small but should cater for your fry-up needs. 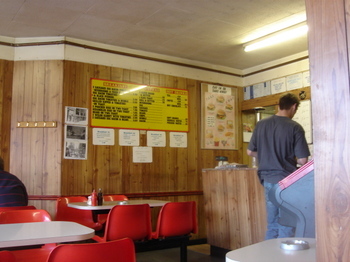 I don't think the replacement Panino d'Oro cafe, also in Marchmount St, does fry-ups, but you could check. There's a couple of caffs in Chalton St. Apparently Bob Crow sometimes eats at one of these - who needs an Egon Ronay recommendation !!! Eversholt St has a couple, Victory Cafe and another one,can't remember the name. Both are cheap - but fairly grim. If you want a more picturesque cafe location, try the Sorrento Snack Bar in Wolborn Walk(or Place ? ), off the Euston Road, near the station. This is the only caff I've seen in London with a Georgian-style bow-front window. Just found this site and it's great. Can't wait to read the book, it's great that things like this get the recognition they deserve. The grange cafe at 188 grange road actually belongs to my parents and the guy youname as "George" isnt the real george just a pretender to the throne!!! My dad is the original "george" and before the area was developed into flats and apartments used to run the cafe with a rod of iron - if you were silly enough to ask for anything exotic such as salad you'de get a swift sorry no more salad left!!!! - the great thing in those days was that my dad made EVERYTHING from scratch!! chicken curry, escalope, bolognase etc. The place used to have real character with all sorts of people dining there from south east villians to local politicians from all the antique dealers from the old bermondsey market to the local CID!!! it really was the place to eat then!!! and we're only talking the 1970's / 80's and very early 90's. 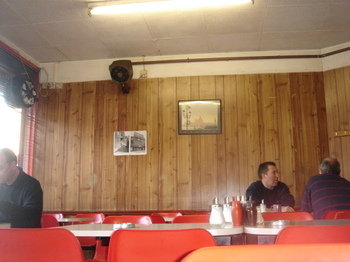 Its the longest established cafe in Bermondsey having been on the same site now for over 100 years!!!! check out the history on the walls! good to see its still upholding the good name of greasy spoons and as my parents still own the place but have long since retired to Cyprus i will let the REAL George and Rose know that the place is still appreciated!!!!!!!!! Nice Food, Good Prices and friendly service. This is a very warm and friendly cafe. The food is very good cheap prices and quick. Very nice specials all home made eg curry shepherds pie bolognese roast pork lamb and beef dinners. Hi , I havent had the pleasure of visiting the Cafe yet but hope to real soon. i just wondered if among your collection there might be such a photo, he also had a brother called Alf Jackson who was also a boxer. This would mean so much to me as i have been trying for years just to get some information or better still, a photo of him.